Antique - Blair & Co. Beaconsfield Pottery of Longton, England - Pattern 1073 - Made from 1880 through 1911 - (total of (28) Pieces - Hand Painted in 22kt Gold. This great Antique Pattern #1073, was made by Blair & Company during the years of 1880 to 1911. 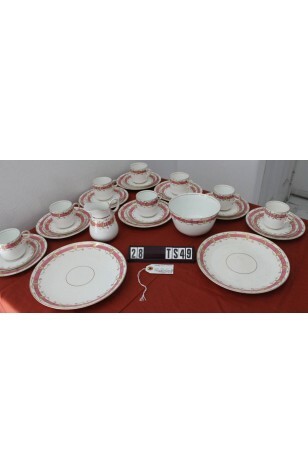 It is a beautiful Tea Set on Bright White Background, Bright Pink Band with 22kt Gold Leaf and an Entertwined "C", or "Horse Shoe" design, over the Pink Band. All Items are Rimmed with 22kt Gold. There is also 22kt Gold on the Verge of the Plates, 22kt Gold Trimmed "Ring" Style Handles. This is a very striking Pattern from the turn of the 20th Century. All Pieces are in strikingly excellent condition. This great Antique Pattern #1073, was made by Blair & Company during the years of 1880 to 1911. It is a beautiful Tea Set on Bright White Background, Bright Pink Band with 22kt Gold Leaf and an Entertwined "C", or "Horse Shoe" design, over the Pink Band. All Items are Rimmed with 22kt Gold. There is also 22kt Gold on the Verge of the Plates, 22kt Gold Trimmed "Ring" Style Handles. This is a very striking Pattern from the turn of the 20th Century. All Pieces are surprisingly Good Resale Condition.